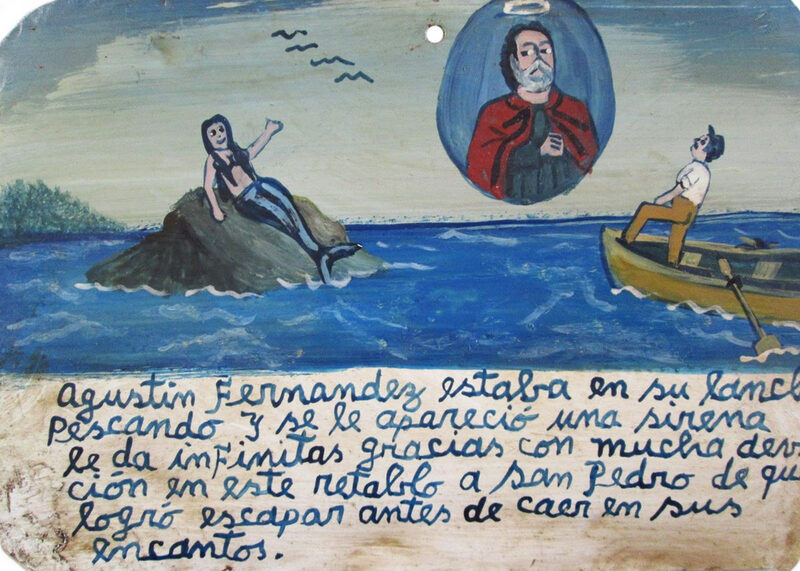 1943, a mermaid appeared to the boatman Catarino Fernandez. 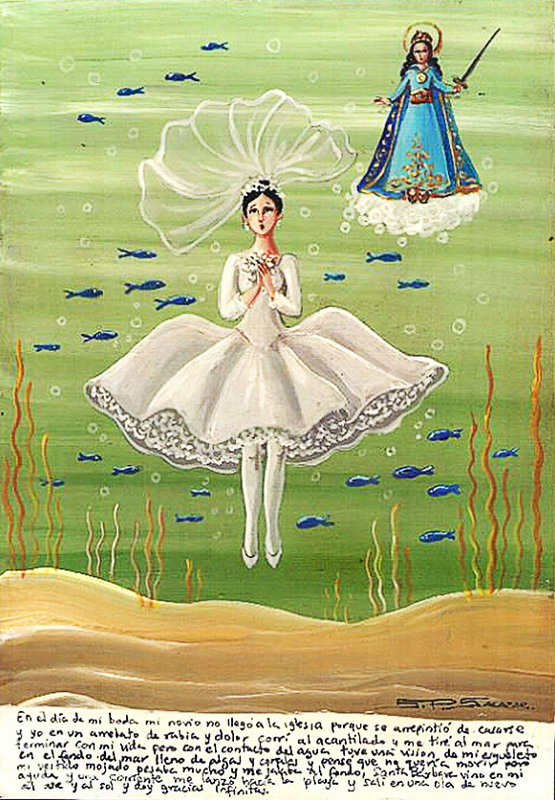 She tried to take him to the bottom of the sea. 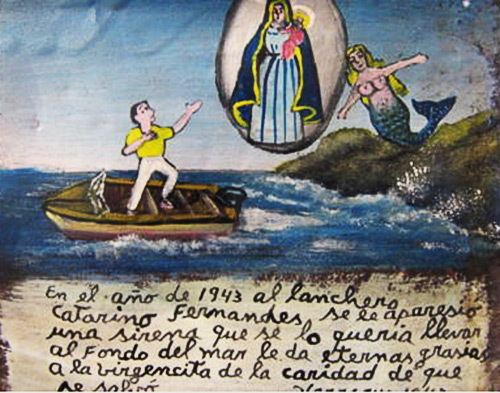 He thanks the Virgin of the Charity because he escaped. 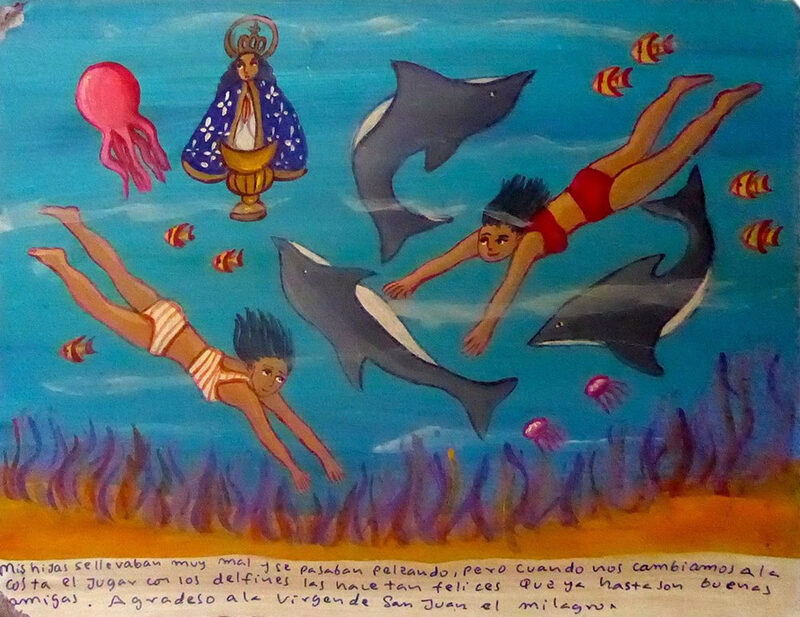 Fernando Santoyo was diving and was lucky to find an antic gold cup. 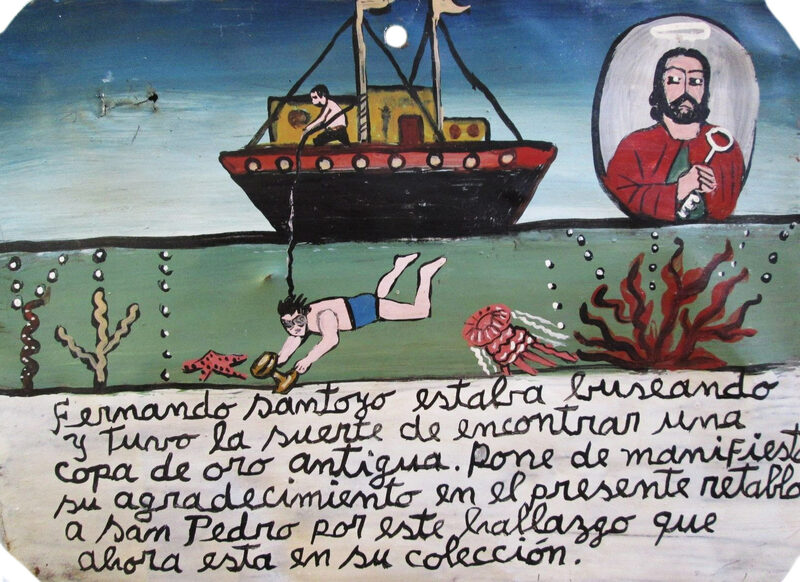 He thanks Saint Peter with the present retablo for this discovery which has become part of his collection. 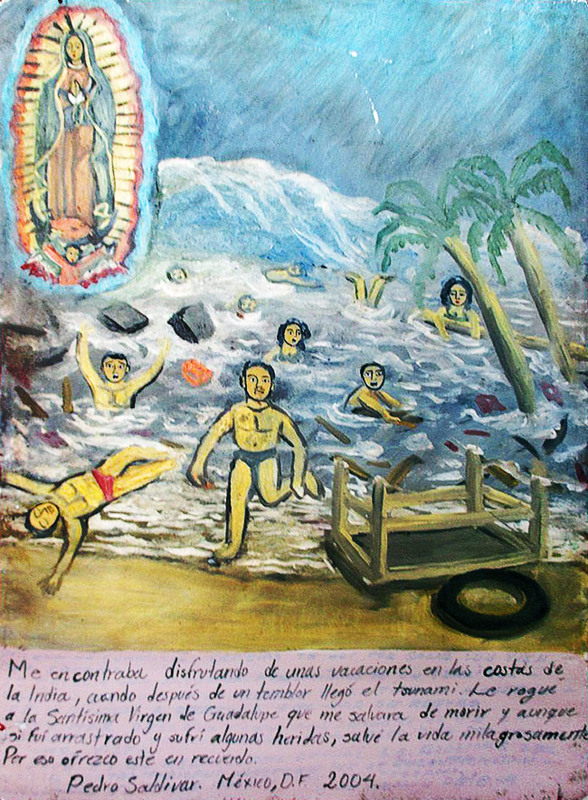 When Miguel Martinez was swimming in the sea, he had a congestion. He lost his senses and went to the bottom. 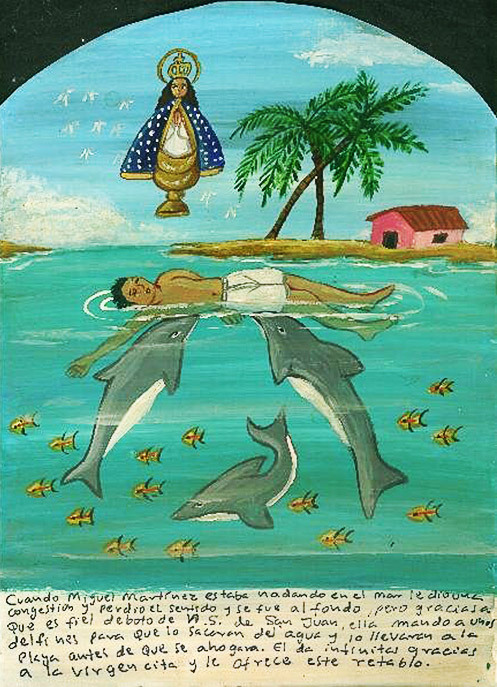 But thanks to his devotion to the Virgin of San Juan the Virgin sent dolphins to help him. The dolphins took him out of the water and brought to the beach before he drowned. 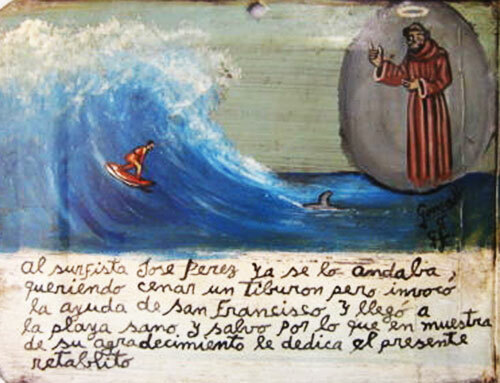 Miguel is infinitely grateful t the Virgin and offer her this retablo. My daughters didn’t get along and were constantly fighting. But when we moved to the beach, they started to play with the dolphins. It made them very happy so they became good friends. I thank the Virgin of San Juan for this miracle. I was enjoying a vacation at the beaches of India when after an earthquake came the tsunami. 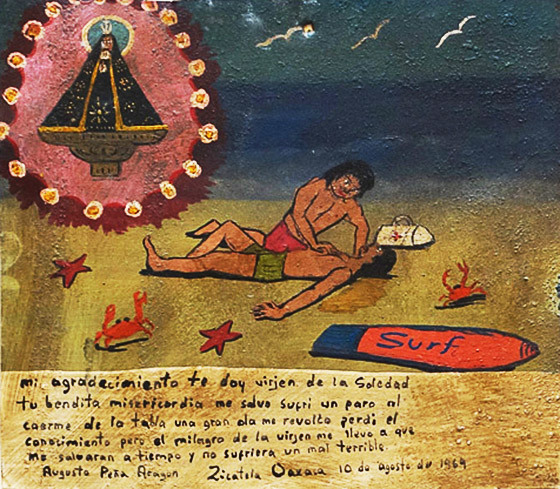 I prayed the Virgin of Guadalupe so she would save me from death. Although, I was swept and suffered some injuries, miraculously I came out alive. I offer this in memory. I went to swim and dive to watch fish. Then I met face to face with a sea monster. I was in fright thinking that he was going to attack me with its claws, since it was half-devil, half-man and half-fish and he had giant claws. 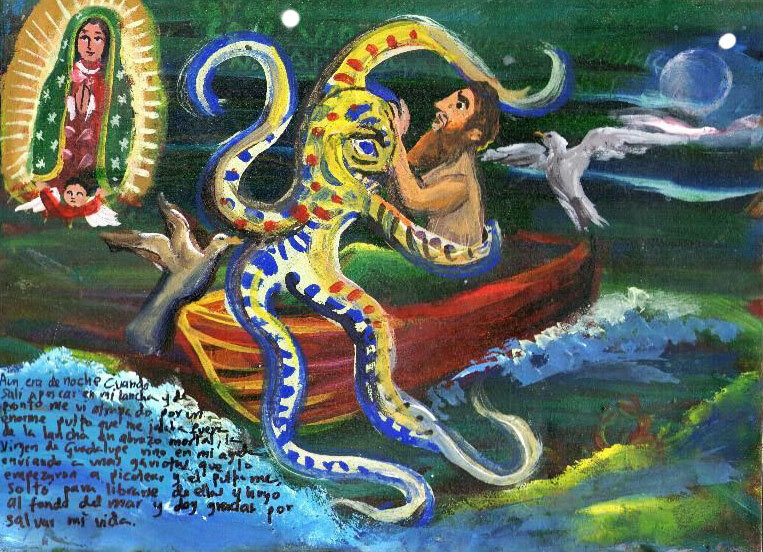 But thanks to the Holy Heart the monster seemed to get scared more than me when he saw me, so he swam away rapidly. I felt relieved but still—until the mister changed his mind and came back—I swam back to the beach. 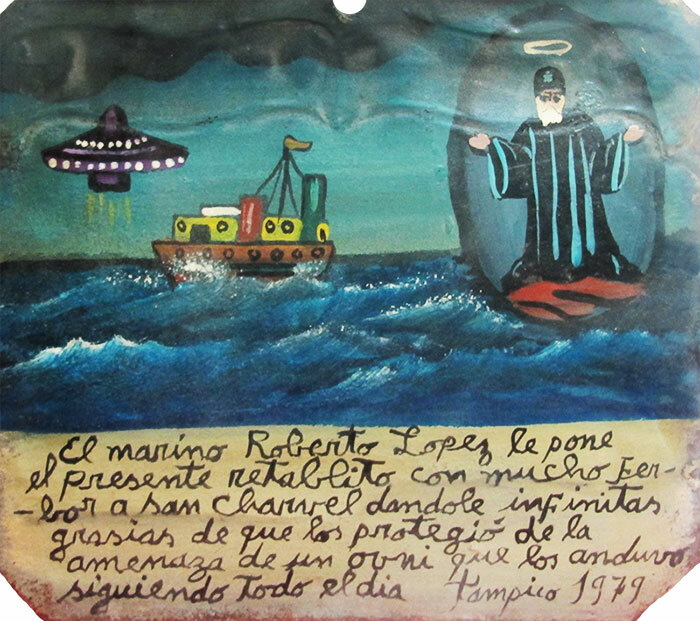 The sailor Roberto Lopez brings this retablo to Saint Charbel thanking him for having protected him from the threat of an UFO that followed them all day. 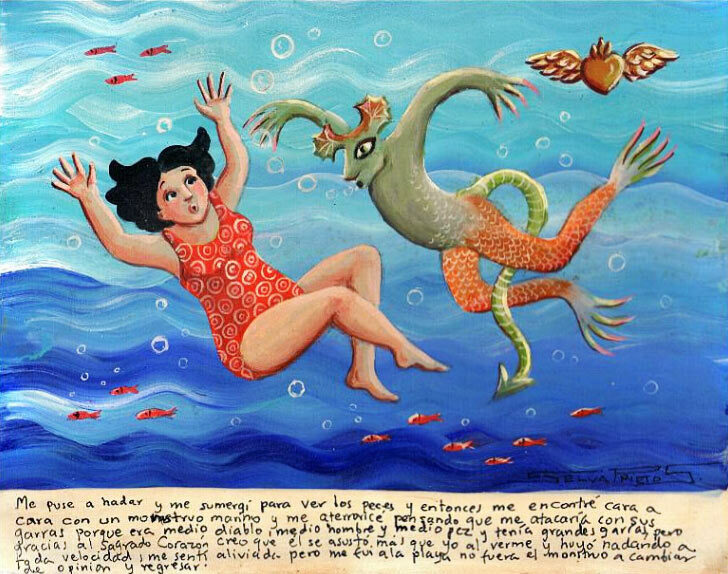 When I was swimming, a mermaid began to call me to join her at the bottom of the sea. 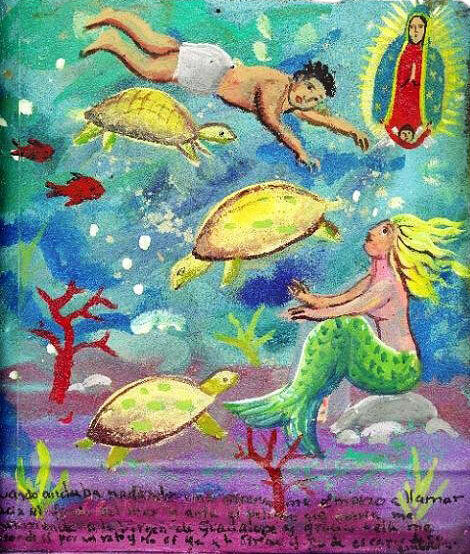 Before this danger, I entrusted myself to the Virgin of Guadalupe, and thanks to her could escape from the mermaid’s chant.